Parts and equipment to make no till farming easier and more profitable. At Exapta, our goal is to make no till farming easier and more profitable. We help farmers all across the world achieve this by making add-ons, attachments, parts, and equipment that are easy to install, durable and effective. There’s much that you can’t control in farming, in conventional tillage and no tillage. Climate, the weather, soil conditions, the price crops will sell for…these and many other factors are beyond your control. But there are simple, cost-effective ways to improve crop yields, which, in challenging years, can mean difference between making money and losing money. And in good years, well, it’s still great to get some extra cash out of your crops! When it comes to no till seeding, it’s all about seed placement, and the products that we design and manufacture help create the best conditions for seeds and seedlings, for all types of crops, under some of the toughest conditions in farming. It’d be nice if you could do your no till planting when the soil wasn’t too dry or too wet, not too hard or too soft. And if Mother Nature would simply cooperate throughout the season, delivering just the right amount of rain and sun, at just the right times, well, that would be fantastic, too! But since ideal conditions rarely, if ever, exist in farming, we’ve designed our products to compensate for Mother Nature’s abundance of inconsistencies. Consistent seed furrows, at uniform depths, with the seeds nicely embedded in the bottom of the furrow, and loose soil covering the seed…well, that’s what we lie awake at night thinking about! And then we wake up in the morning, ready to teach farmers how to use our products, ready to invent new parts and equipment that will continue to improve no till farming. Founded in 1998, we’re based in Salina, Kansas, and we have over 100 no till products that we can ship out worldwide. These add-ons, attachments, parts, and equipment can be used on John Deere, Kinze, AGCO-White, Great Plains, Case IH, Monosem, and other brands of farming machinery. For further information on our company, or to order parts and equipment, please call (800) 417-8020, or e-mail info@notillagriculture.com. Please note: We can ship all of our no till products and equipment anywhere in the U.S., Canada, and the world. P.S. Be sure to check out our hydraulic down-pressure system for John Deere Drills (50, 60, and 90 drills) – it’s a game-changer! Reduced Soil Erosion: One of the primary benefits of no till farming is the reduction in soil erosion. With no till farming, there’s minimal soil disruption – furrows are created, and seeds are planted and covered up. Less soil disruption leads to less soil erosion, from wind and water. No Till Leads To More Fertile Soil: Tilling a field year after year can damage the structure and ecology of the soil, eventually rendering it less fertile or infertile. 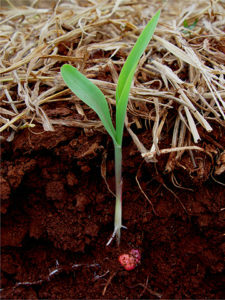 In no till farming, the residue from previous crops is left on the surface and allowed to break down, providing valuable nutrients in a slow, time-release manner as the crop is growing. History Of No Till Farming: Mechanized no till farming has its origins in the United States in the 1960s, thanks to new herbicides that were introduced in the 1940s and 1950s. These herbicides enabled farmers to control weeds, without having to turn over the soil. 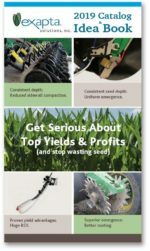 With each passing year, more farmers are switching some or all of their fields to no tillage, in large part because of ever-improving no till equipment and techniques. No Till Farming Costs Less: No till planting can lead to significant savings in labor, fuel, machinery overhead, and tractor hours. With no till seeding, there’s one pass across the field, compared to 3-5 passes for conventional tillage. No Till Can Increase Crop Yields: As fields transition from tillage to no till, the soil becomes more structured, and water is conserved within the soil, which can lead to higher crop yields. Herbicides And Fertilizers: Once the soil reaches a new equilibrium of organic matter level, no till cropping can be more fertilizer efficient. Phosphorus fertilizers are particularly efficient in no till, since stirring of the soil with tillage causes P fertilizers to become more tightly bound to soil particles and unavailable to plants. With no till, herbicides are generally still used for weed control. Manufacturers of Equipment That Can Be Used For No Till Farming: The top manufacturers of drills and planters that can be used for no till farming are John Deere, Kinze, Monosem, Case IH, Great Plains, and AGCO-White. Other brands are available in various countries. The success in no till conditions with any particular drill or planter model depends on the design, and we discuss those principles on this site. Please note that the information on this website is for general informational and educational purposes only. Actual results for all of the products and techniques described on this website will vary because of climate, crops, equipment, and diversity of soils. U.S. patents are pending on the Ninja Seed Bounce Flap and UniForce. U.S. Patent No. 6,907,833 for the Thompson Wheel. U.S. Patent No. 8,978,564 for the Valion Seed Tube Guards. The following are trademarks owned by Exapta Solutions, Inc: Exapta, Thompson Wheel, Valion Guard, Ninja Flap, DuraLok. Keeton is a trademark of Precision Planting. Copyright , Exapta Solutions, Inc.